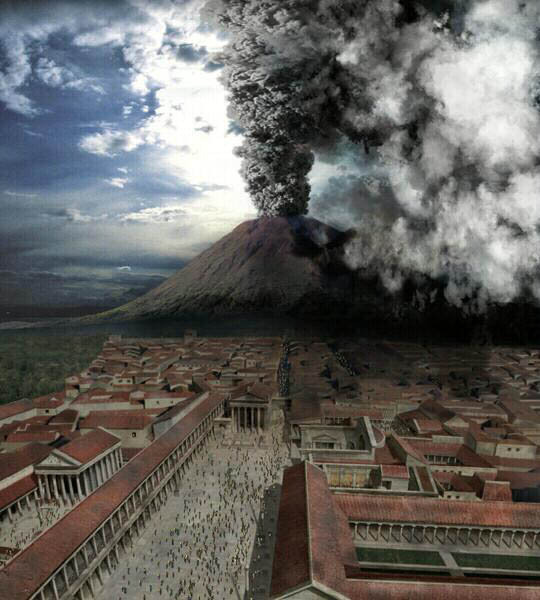 The first 3D feature film about the destruction of Pompeii. A mix of historical epic, disaster movie with a romantic background and swords and sandals gladiatorial auctioneer. 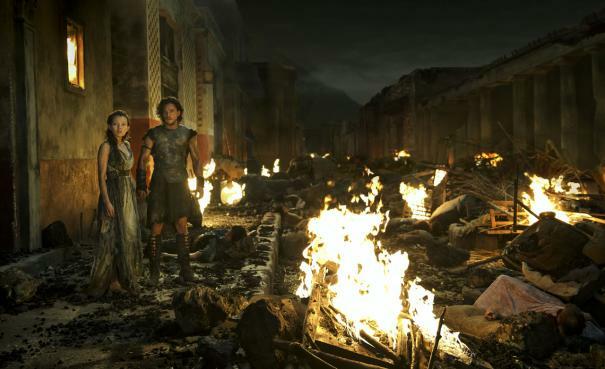 According to Pompeii's director, the intention was to make a "spectacular period disaster movie" . Anderson hoped to copy the approach of James Cameron's Titanic: make a movie based on an historical event that ended in disaster, and integrate a romantic story of young love into the plot. Anderson's movie has Milo a slave turned gladiator, trying deperately to save his beautiful girlfriend Cassia from a corrupt and vicious Roman senator. While Vesuvius erupts, Milo and his gladiators fight to save Cassia and escape the cataclysm. All of this remarkably resembles Sergio Leone's 1959 epic Last Days of Pompeii, and the similarly titled 1935 movie made by the team that gave the world King Kong a couple of years earlier. Both of them feature gladiators as characters and gladiatorial combat in the arena. Both weave a romantic story into the destruction of Pompei. Anderson's movie also borrows another key feature from another popular historical epic - Ridley Scott's Gladiator. 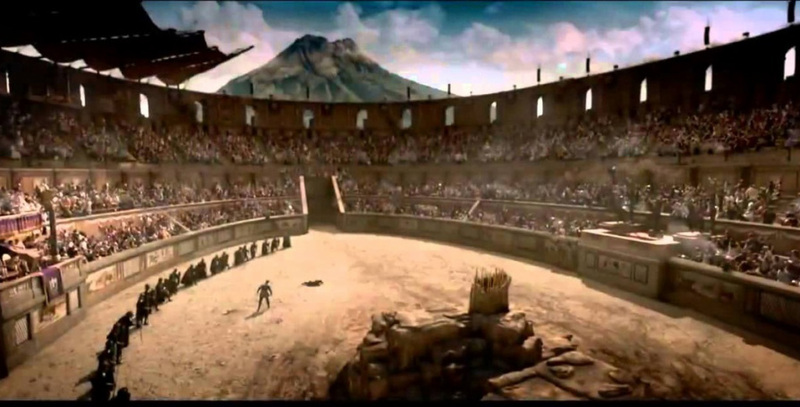 Like that film, Pompeii features elaborate gladiatorial games. 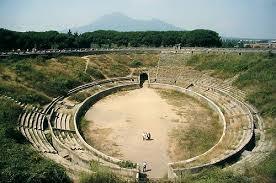 The doomed Pompeii possessed a fine amphitheatre, holding about 20 000 people, in which gladiatorial fights were held. Only twenty years earlier a major riot broke out between the townsfolk and supporters from another town during a gladiatorial games (just like modern football riots), resulting in deaths and injuries. The Emperor shut the arena down for the next 10 years. Below are three views of Pompeii's amphitheatre today. The tunnel from which gladiators emerged can be clearly scene in left and middle shots, and the seating arrangements and stylish, strong exterior are impressive. Scenes of gladiatorial combat not only featured in early silent versions of feature films about Pompeii. They can also be found in the 1935 movie , and in Segio Leone's 1959 Last Days of Pompeii. Anderson's movie borrows heavily from the Leone film and from Scott's Gladiator. Take a look below. In both 2014's "Pompeii" and Leone's 1959 movie (right, Steeve Reeves with Christine Kaufman) a romantic relationship is set against the backdrop of impending doom. Nasty, scheming, devious villains in positions of great political power feature in both movies. The 2014 Pompeii follows the 1935 Last Days of Pompeii in incorporating views of the eruption from the perspective of the nearby Bay of Naples. According to the makers of Pompeii considerable acre was taken to ensure the movie's authenticity. Publicity for the film declares that "six years" of research swent into making Pompeii "as historically accurate as possible." Yet there are several blatant examples of inaccuracy. The most obvious is the film's portrayal of Pompeii as a sort of Sodom and Gomorrah on the slopes of a volcano, just ready for some supernatural punishment. Far from being a sleazy den of vice the city of Pompeii was in fact a relatively placid place favored by relatively well-off retirees enjoying the mild coastal climate and a thriving market town for the many farms on the fertile slopes of Mt.Vesuvius. The sexually explicit sculptures and artwork that can be seen today in what were some restored Pompeian buildings were commonplace throughout Roman Italy, not evidence of a lascivious lifestyle. It's just that the statues, frescoes etc survived by being buried for centuries, whereas in other Roman cities they were later demolished, replaced, painted over or obliterated over time. Pompeii was not exactly a den of vice; it was a prosperous coastal town, popular with retirees and a market centre for surrounding farms. Pompeii today: despite what the movie shows, most of Pompeii remained upright and was not destroyed by fire. Instead, rugged building materials withstood the inundation of a terrible red-hot slurry of pumice and gas. The human inhabitants were less fortunate. Anderson's Pompeii - like other movies about the disaster - delights in showing scenes of Mt.Vesuvius spewing out enormous fireballs which rain destruction on the town and set it alight. The 2014 Pompeii has the added thrill of showing it all in 3D. Despite the shots of homes, buildings, amphitheatre and even people on fire, the devastation was not caused by fire. In fact, Pompeii's buildings were structurally remarkably fireproof. This because they were not built of timber, but of limestone, brick, tufa ( ironically, volcanic ash mixed with water to become stone-like) or a mixture of rubble and cement (a recent Roman invention). This explains why so many buildings in Pompeii survived and can still be seen and walked through today. The above right image shows how rugged and durable these construction materials were. The main cause of death and destruction from the eruption was NOT fire. It was even more horrible if rather less photogenic. The town was inundated within minutes by an avalanche of pumice, ash and gases erupting from the volcano and combining at temperatures up to 300 degrees C. in a horrendous slurry known as a pyroclastic flow that poured down the slopes of Mt.Vesuvius at tremendous and quickly covered the town under a suffocating blanket of three to five metres of ash and pumice. Above left image from movie is accurate in that it seems to show the clouds of ash and pumice that accompanied the eruption of Mt. Vesuvius. The many scenes of fires in Pompeii (center) suggests that fire was the main cause of damage and loss of life; in fact, suffocation / smothering by the avalanche of incredibly hot ash and pumice (and gases) was chief factor. However, scene on right does hint at a shower of ash/ pumice etc. The movie includes some images of the macabre but archaeologically invaluable aftermath of the eruption. Centuries later, when the town's site was unearthed, excavators and looters found strange cavities in the solidified lava flow. The pyroclastic flow of ashes and pumice had covered the bodies of humans and some animals, eventually setting solid. While bones, internal organs etc decomposed, what was left was a mould of the corpse at the time of death. Pouring plaster of paris into the space within the mould, resulted in a replica of the corpse at the time of death. So today we can see replicas of families holding each other in a final embrace and people 'frozen' while trying to crawl to safety. Image from movie centre; other images show visitors in galleries showing casts recovered from Pompeii, plus images of casts of some victims in sites in which they were found. Note dog with collar.